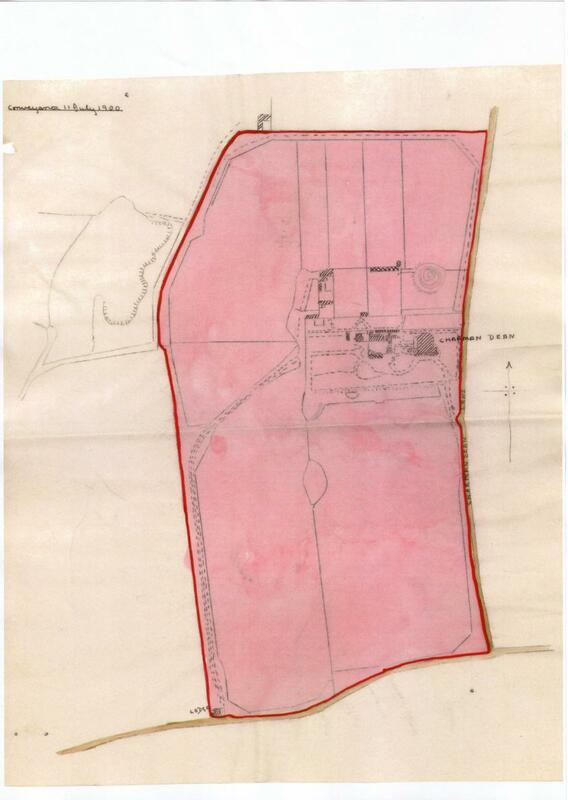 These pages collate some of the maps and photos of interest which we have found when researching the history of the estate, and some can be found throughout the rest of the site. Thanks is provided to each source for use of maps or photos online in this site. 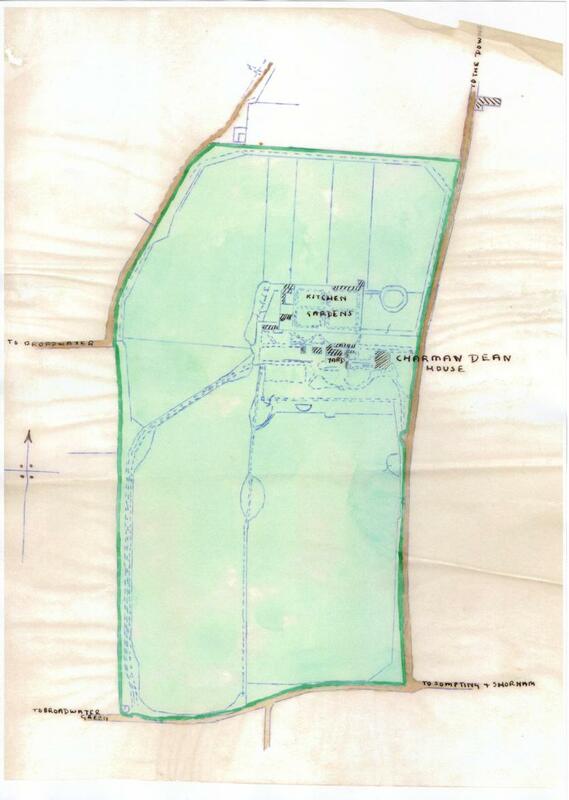 Below is an aerial photo dated 1927, before development of the lower part of Charmandean Estate started. 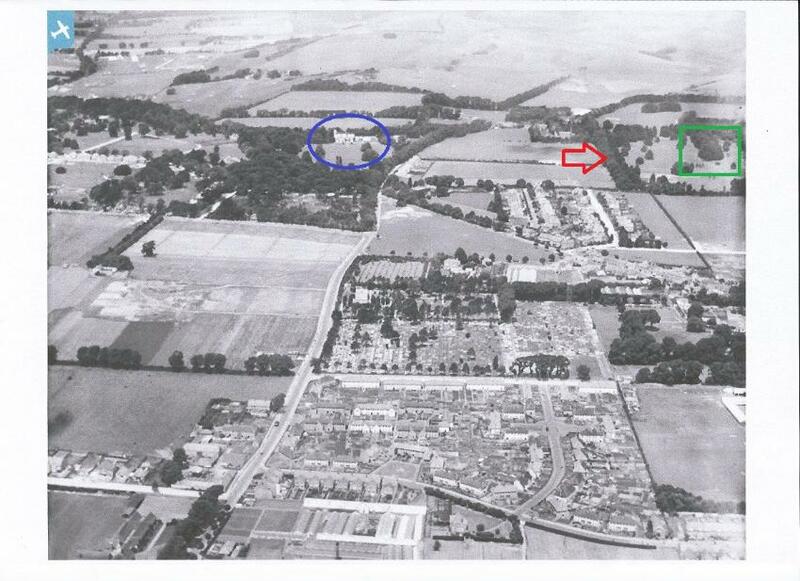 Broadwater Green can be seen in the centre of the photo, with The Warren (house, demolished to make way for Excess Insurance, now Worthing College - in blue) The red arrow indicates the West boundary of Charmandean Estate, with the trees bordering the recreation ground. 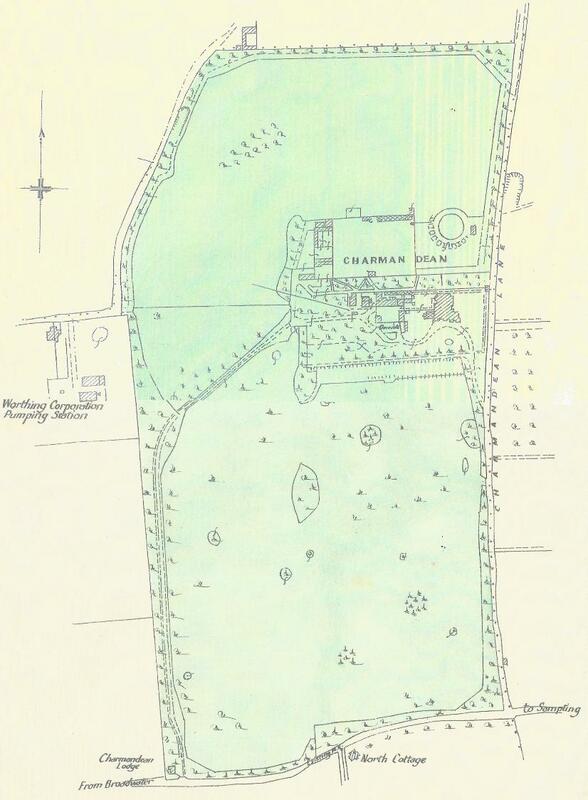 The woodland in the green square is the woods still in existence now in Charmandean Open Space. Citation: Image from britainfromabove.org.uk, location: Broadwater. Below is draft Conveyance dated 11th July 1900, note the house being called 'Charman Dean' and the Lodge in the South-West corner. 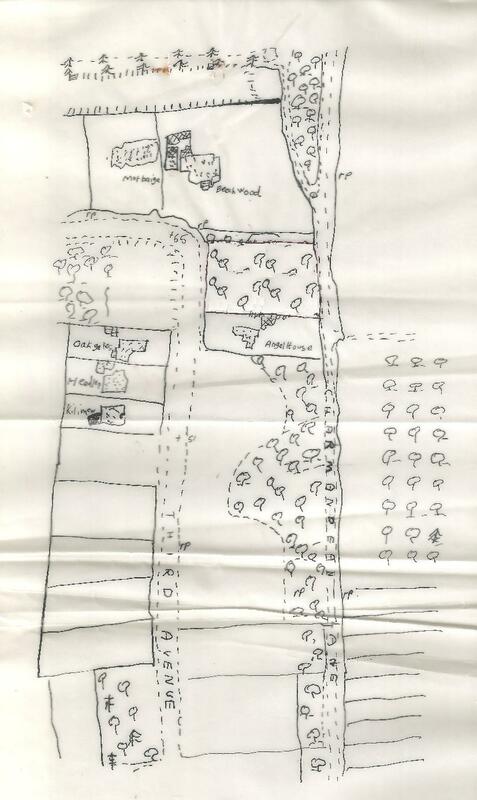 This drawing appears to be a few years later than 1900, with the Kitchen gardens marked on the map and the woods suggested in the centre of the map are the woods which, part of, are now at the North edge of Charmandean Open Space. Worthing Corporation Pumping Station is referred to on some of the maps - whilst researching we found this old Postcard of Hill Barn Lane, showing the Water Works in the background. An interesting map of Third Avenue, about 1957. 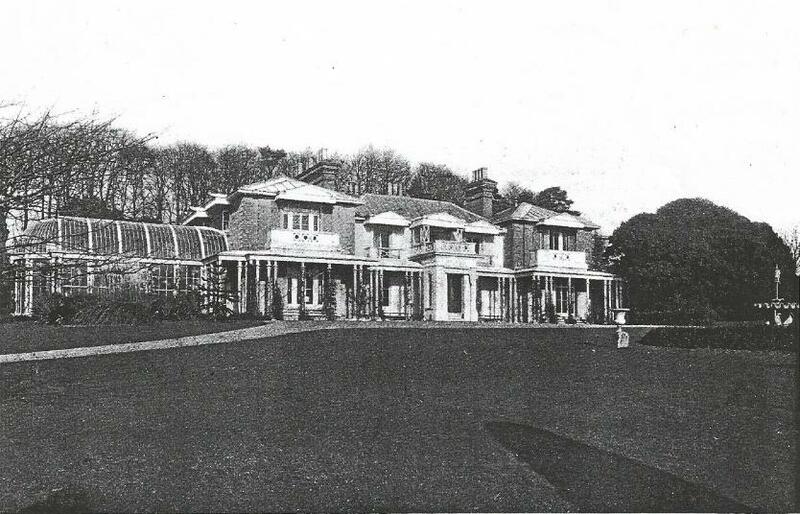 Note the original Eastern driveway to Charmandean House at the top, with the Yew Walk marked. 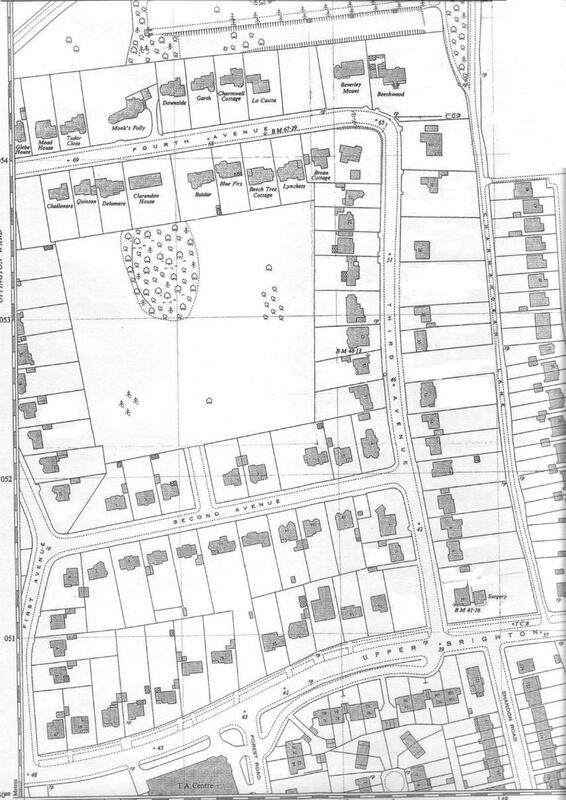 Much of Third Avenue wasn`t developed at this time, and Beeches Avenue also only existed half the length it is today. 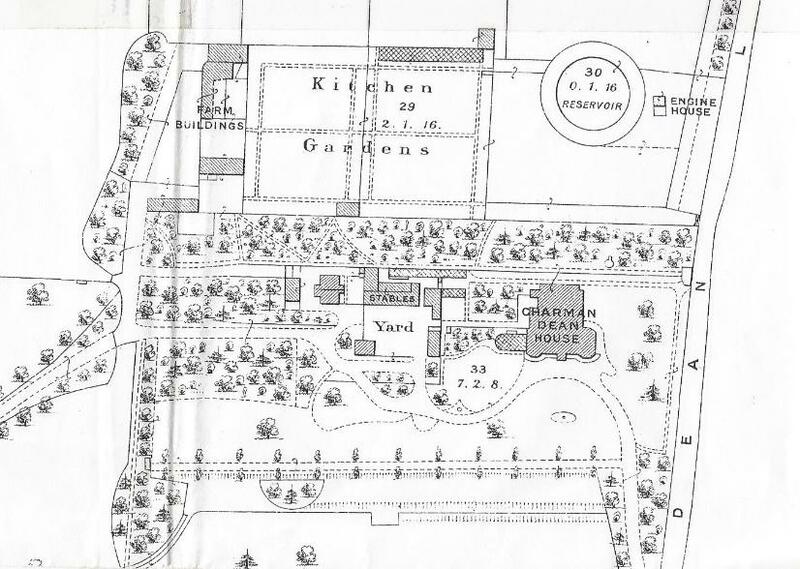 A map dated 1959 - note that the East and West entrances to Charmandean House are still in use, (Southern part of the West entrance now encompassing First Avenue), and the stepped lawn terraces at the top of the map. The house was not demolised until 1963. 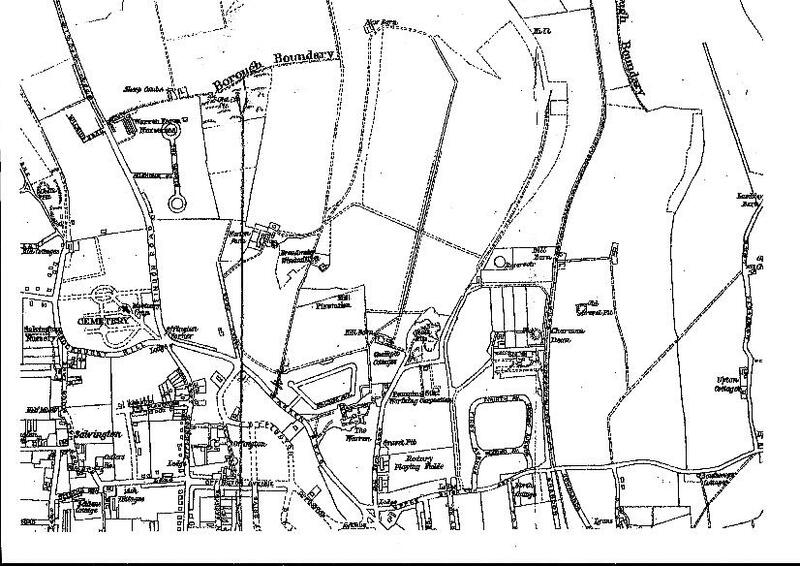 The above map we believe is dated c.1935, as First Avenue didn`t extend beyond it's junction with Fourth. 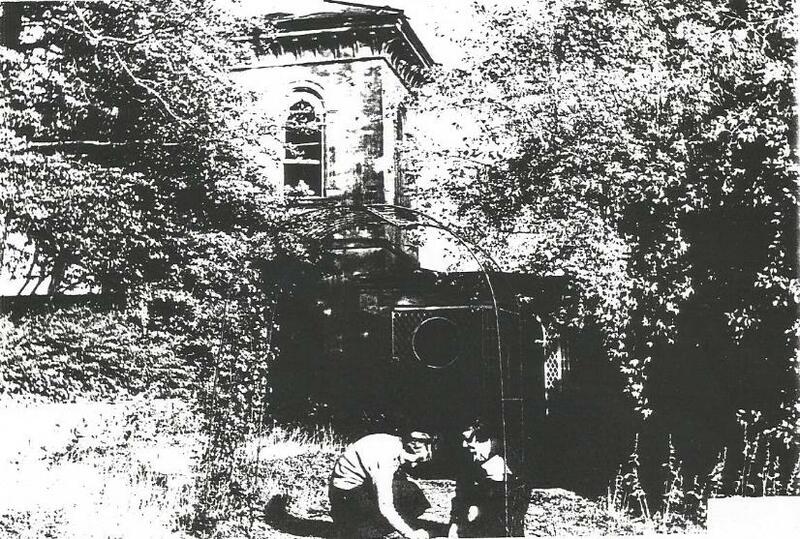 This also still shows the Broadwater Windmill, on the track between Warren Road and Cissbury. We believe this photo is c.1945 post-war, showing the much of lower part of First, Second, and some Fourth Avenue houses built. 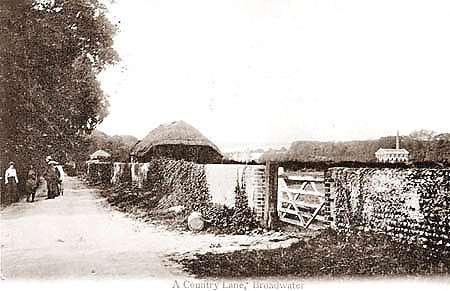 Another photograph of interest showing more of Broadwater post war, about 1946. The below photo is an unusual shot of the tower at Charmandean, which we understand had fantastic views towards Beachy Head to the East, Isle of Wight to the West, and being 150ft above Sea Level, down to the sea to the south. We believe the tower was demolished during the war, but the foundations are still there and in private gardens. Stories about the tower feature in the 'Latest News' section. A rare view looking South showing the view that the House would have had; the fountain in the foreground is also in the above. The line of Yew trees features on this website, and these trees are now in the rear gardens of houses in Longlands Spinney. The fountain water feature would have been where the grass verges are now in The Spinney. 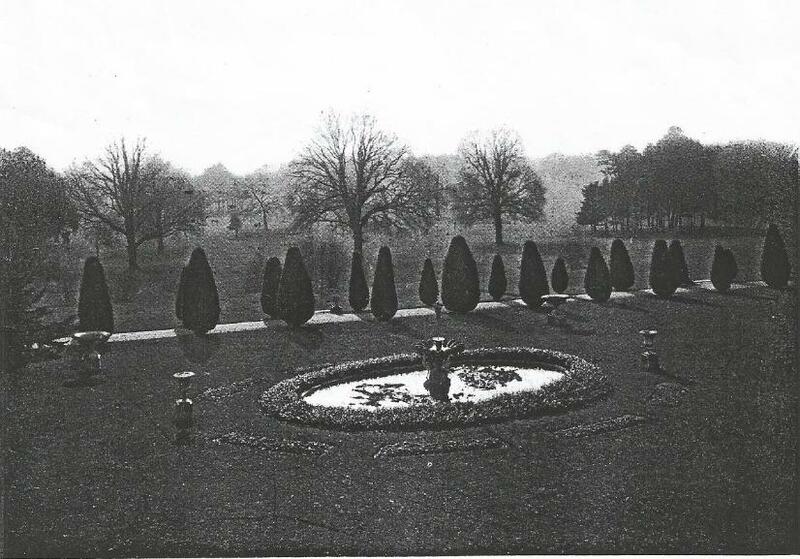 The exact positioning of the Yews, and the fountain, can be found in the 1927-present overlay map in the Longlands page. 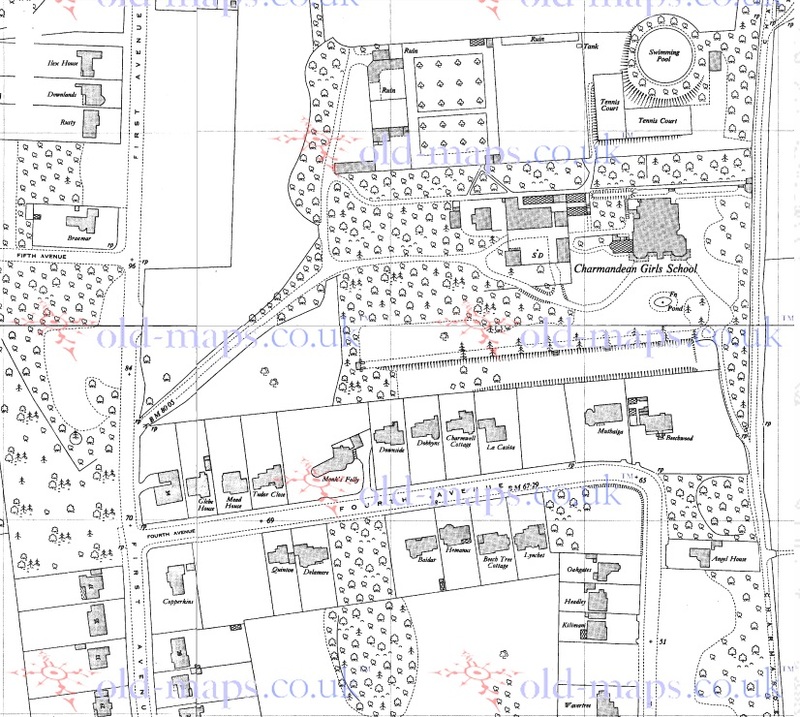 A few maps from 1953/1954, showing progression of development.